Synthetic peptide, corresponding to a region within the amino acids 1-50 of Human TLS/FUS (SwissProt: P35637). Human ovarian carcinoma tissue. Mouse squamous cell carcinoma tissue. Our Abpromise guarantee covers the use of ab84078 in the following tested applications. WB Use a concentration of 1 µg/ml. Detects a band of approximately 74 kDa (predicted molecular weight: 75 kDa). 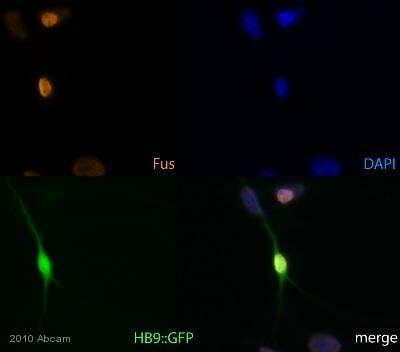 ab84078 staining TLS/FUS in embryonic mouse motor neuron culture at 5 DIV by ICC/IF (Immunocytochemistry/immunofluorescence). Cells were fixed with formaldehyde, permeabilized with 0.5% Triton in PBS for 15 minutes and blocked with 4% BSA/4% serum for 1 hour at 20°C. Samples were incubated with primary antibody (1/500: 4% BSA; 4% serum in PBS 0.1% Triton) for 16 hours at 4°C. A Cy3®-conjugated-Goat polyclonal to rabbit IgG, dilution 1/1000, was used as secondary antibody. 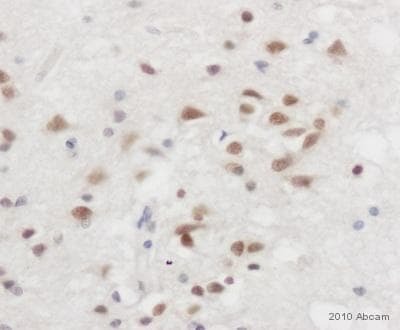 ab84078 staining TLS/FUS in Human brain tissue sections by Immunohistochemistry (IHC-P - paraformaldehyde-fixed, paraffin-embedded sections). Tissue was fixed with formaldehyde and blocked with 3% serum for 30 minutes at room temperature; antigen retrieval was by heat mediation with a citrate buffer. Samples were incubated with primary antibody (1/2000 in horse serum) for 12 hours. A Streptavidin-conjugated Horse anti-rabbit monoclonal (1/250) was used as the secondary antibody. Publishing research using ab84078? Please let us know so that we can cite the reference in this datasheet.